The new MacBook Pro generated over seven times the revenue that the 12-inch MacBook did over its first five days of availability, according to Slice Intelligence. If accurate, that means it took the new MacBook Pro just five days to accumulate 78% of all the revenue generated by the 12-inch MacBook since its April 2015 launch. 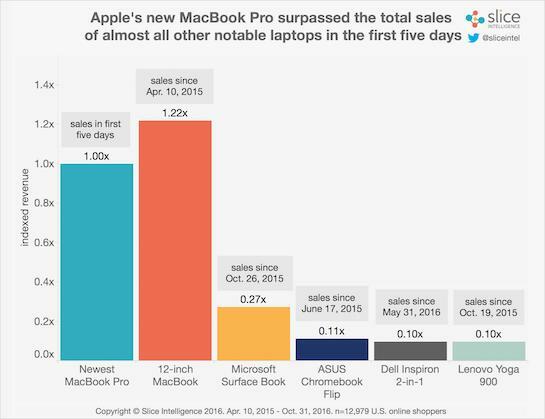 The data follows Apple marketing chief Phil Schiller’s claim the new MacBook Pro had received more online orders than any previous MacBook Pro as of November 2. Apple has also reportedly told its overseas manufacturers to expect strong MacBook Pro shipments to last until at least the end of 2016. The new MacBook Pro’s apparent early success may come as a surprise to a vocal crowd of professional users who have criticized, among other things, the notebook’s lack of ports and limited RAM. Schiller said the early criticism and debate has been “a bit of a surprise” to him, but common for any new Apple product. Slice Intelligence extracts detailed information from hundreds of millions of aggregated and anonymized e-receipts. The research firm has a panel of 4.4 million online shoppers signed up for its services such as Slice and Unroll.me. It is also the exclusive e-commerce data provider for the NPD’s Checkout Tracking e-commerce service. Laptop Magazine’s Mark Spoonauer went hands-on with both the 13-inch and 15-inch MacBook Pro models with Touch Bar. Spoonauer showed off the Touch Bar’s ability to change depending on what app is open, as well as the default function row icons. Additionally, the design and size of both the 13-inch and 15-inch models are shown off, as well. Finally, Touch ID functionality is also demonstrated. Touch ID, of course, will allow for the MacBook Pro to be unlocked more easily, as well as for Apple Pay purchases to be completed without the need for authentication with another device. Engadget also took a look at the 2016 MacBook Pro, noting of the new slimmer design, as well as the USB-C ports, Touch Bar, Touch ID, and much more. The Touch Bar is showcased in use with Safari, with bookmarks and other quick links intelligently appearing. Next up is SlashGear, who spent some time with Apple’s new laptops, as well. The blog again highlights the Touch Bar and its intelligent app switching, specifically in iMessage and its ability to show emoji and Tapback options. The video also shows the ability to customize the icons that appear in the Touch Bar. The general consensus from early hands-on seems to be that Apple has a solid update on its hands with the new MacBook Pros. The design, while similar to the previous generation, is slimmer and lighter, making it easier to carry around for extended periods of time. Additionally, the Touch Bar seems to work very well and is incredibly quick to update as you move around various apps and interfaces. It’s also nice to see that the Touch Bar is customizable to the degree that it is, and open to third-party developers. View a few more hands-on videos with the new 13-inch and 15-inch MacBook Pros below, as well as one video with Apple’s new TV app for Apple TV. A new discovery in yesterday’s release of macOS 10.12.1 hints at the much anticipated OLED touch screen expected to be integrated into Apple’s upcoming MacBook Pro rumored to arrive at the company’s October 27 event this week. Within resources for System Preferences, updated assets in macOS 10.12.1 show a new virtual keyboard layout with the top row of the current keyboard design missing. It’s still unclear exactly how Apple will implement the touch screen functionality, which is said to include contextually sensitive buttons of some kind based on the app in use. Apple was also planning to possibly include Touch ID functionality in the new MacBook Pros, and earlier discoveries in macOS seemed to hint at possible integration into or near the new OLED touch bar. In addition to the new functionality with the OLED touch screen, Touch ID would open up possibilities for Apple Pay on the web, unlocking the Mac itself, and other apps without the need of an iPhone or Apple Watch for authentication. In addition, the new MacBook Pros are said to be thinner and have a smaller footprint, a larger trackpad, and offer the usual upgraded internals including new AMD graphics and more. The latest reports from supply chain sources this week backed up earlier reports that Apple will release a new 13-inch MacBook in addition to two MacBook Pro models at its event this week. The report also indicated new iMacs and 5K display in the pipeline for next year. According to sources, a KGI analyst report, and leaked parts, Apple’s next MacBook Pro will feature an OLED capacitive touch panel that replaces the fn-key row. Such a change has been hotly debated online, with opponents lamenting the potential lack of tactile response for touch typing, and proponents salivating over the type of software flexibility that such a setup might offer. Needless to say, the feature would bring the most significant change to Apple’s laptop line that we’ve seen in quite some time. One of our readers, Cameron, has created a concept that looks like a 12″ MacBook merged with a 15″ MacBook Pro. The concept image features an OLED touch panel that replaces the fn-keys, redesigned hinge, and larger keys with butterfly switches and changes to the arrow key layout. As you can see, the area where the fn-keys normally reside have been outright replaced by an OLED touch panel. The touch panel displays an esc button, f1-f12 buttons with alternate controls, and a power button. The capacitive touch panel’s buttons will change contextually based on the current app or scenario. That means that, for example, you could run an app like Final Cut Pro X, with the OLED touch panel displaying commonly-used shortcuts related to video editing. Such a change harkens back to Steve Jobs’ monologue just prior to unveiling the iPhone for the first time. His beef with smartphones up until that point was that they all featured keyboards that couldn’t change based on context. “They all have these keyboards that are there whether you need them or not,” he stated. Jobs noted that such an issue had already been solved before with the Mac’s GUI and mouse. That rumor about Apple redesigning the MacBook Pro might come true after all. Corroborating a previous report from KGI Securities analyst Ming Chi-Kuo, Cult of Mac claims to have obtained photos of what could be the aluminum casing for a new MacBook Pro. The “spy shots” reveal what appears to be a 13-inch MacBook Pro chassis. Look closely and you’ll be able to spot some big changes. Noticeably missing are the function keys that normally sit above the numbers row. The missing row matches up with a recent report that the new MacBook Pro will sport an OLED touch bar instead of function keys. Replacing the function keys with a touch bar could allow for a multitude of different use cases. If it’s indeed a screen, it could be used to display simple notifications, replace OS X’s dock entirely, or allow for customizable shortcut buttons that change depending on the app in use. There are also a pair of speaker grilles flanking the keyboard. The 15-inch MacBook Pro is currently the only laptop in Apple’s lineup with this kind of speaker grille on the left and right side of the keyboard; the 13-inch MacBook Pro has its speakers built into the vents underneath the hinge. This could suggest audio will get a big boost on the 13-inch MacBook Pro. A second photo shows four USB-C ports (two on each side) and a headphone jack on the right side. A redesign for the MacBook Pro is due. Apple slimmed down the MacBook Pros in 2012 starting with the 15-inch Retina model, and the followed it up with the 13-inch Retina model in 2013. 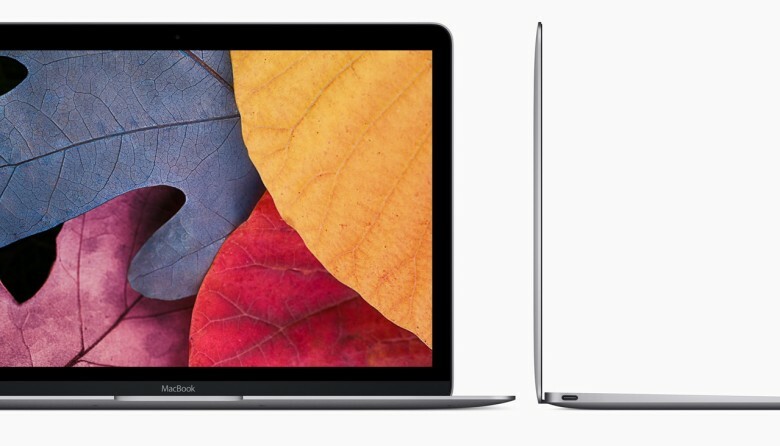 Both MacBooks dropped the optical disc drive, although Apple still continues to sell the 13-inch non-Retina MacBook Pro with it. Apple will hold its Worldwide Developer Conference on June 13. It’s possible Apple may show off the redesigned MacBook Pro. Ming Chi-Kuo’s report, however, claims Apple may not announce them until later this year. Apple gave the world its first-ever peek inside Jony Ive’s super-secret design studio last night on 60 Minutes, but eagle-eyed Apple fans think the company may have revealed more than it intended. 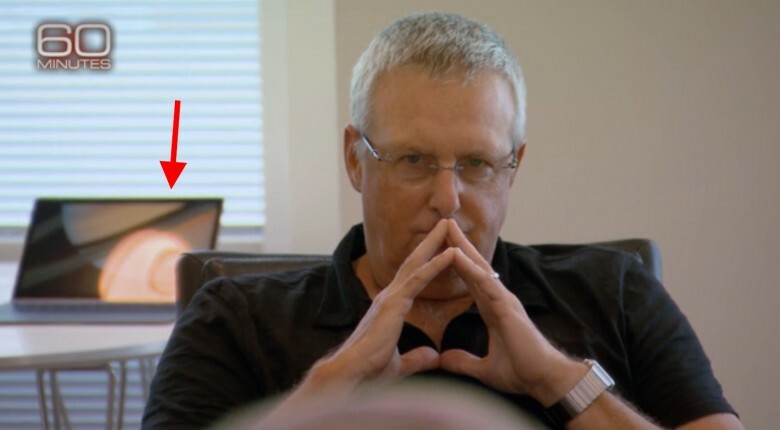 During a very brief shot, taken during Apple’s weekly leadership meeting, a MacBook is seen in the background behind Apple’s general counsel Bruce Sewell that some speculate could be the upcoming 15-inch MacBook Pro. The MacBook display behind Sewell looks larger than the new 12-inch MacBook. The body isn’t as thick as the current 15-inch MacBook Pro model, and the bezel’s margins look thinner than any model we’ve seen. It also sports a Jupiter wallpaper that Apple’s been using to promote the iPad Pro. It is an out-of-focus shot, though, so the most likely explanation is that it’s simply a regular space gray MacBook. It’s highly unlikely Apple just had a concept model 15-inch MacBook Pro lying around before the Charlie Rose interview, which would have been heavily controlled by Apple PR. The entire conference room is actually full of Apple’s current products. Everything from the Mac Pro to AirPort Express can be seen briefly in the background of the group interview. Apple is currently planning to release a new MacBook Pro in mid-2016, with rumors claiming reveal dates as early as March or as late next spring’s Worldwide Developers Conference.